She’s a Canadian and world champion curler, and an all-star mom – and now Kelly Scott can add avid Learn-to-Curl instructor to her already glowing resume. 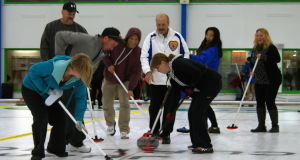 In early November, Scott invited students from her son’s (Nash, 7 years old) elementary school in Kelowna, B.C., to come out and give curling a try – for free. A few years ago, when Kathy Arnold looked into starting a Learn to Curl program at the McArthur Island Curling Club in Kamloops, B.C., she had no idea the results would be so spectacular – and so long term. We all love the time of year when the Scotties and the Brier dominate our TV watching schedules for weeks on end. The players are great sweepers and throwers, the shot-making is superb, and the strategy is rich with complexity. Rocks & Rings: Look what the Fall brings! What a summer for Capital One Rocks & Rings! Despite curling ice having melted away kids were still learning about curling as we visited summer camps, birthday parties and even street festivals across Canada. It was a great way to beat the heat even though the temperatures were soaring. As the curling season approaches, new curlers are being introduced to the game at clubs across the county. On Tuesday morning, The Ottawa Curling Club hosted a special Learn-to-Curl session: under the watchful eye of OCC Curling Professional Earle Morris, The Honourable Bal Gosal, Minister of State (Sport), took to the ice, joined by local high-performance curlers Craig Savill, Rachel Homan, Alison Kreviazuk, Emma Miskew and Lisa Weagle. In some parts of the country the leaves are still falling, and in others, the snow shovels are in action – it’s curling season from coast to coast. 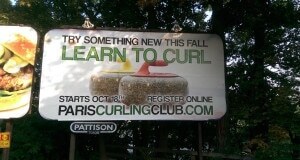 Gone are the times when a two-day Learn to Curl clinic is enough to score new members for a curling club. Business of Curling: Guess What’s Right Around The Corner! The Canadian Curling Association would like to help you out with a series of posters for you to use to help create awareness and to promote your own open house or trial opportunity. The posters build on the success of last season's television commercials featuring Johnny 'the Hammer' Chow, Mary 'Bullseye' Dobbin and Robert 'Clutch' Stevens. Click on the names and you will see what they will look like. 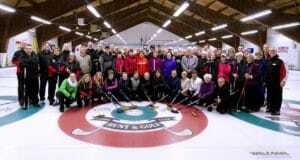 Let us talk about the grassroots of curling. 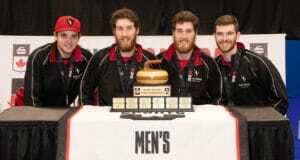 In fact we are going to talk about the shortest, the youngest and sweetest grassroots we can have in curling. That’s right, were going to talk about the Little Rockers.